The word fufu is almost synonymous to some African countries. We love our fufu be it corn fufu, yam fufu or cassava fufu (water fufu). Fufu, foo foo or fou fou is a starchy side that is usually eaten with some sort of soup or vegetable. One of the common types of fufu is that made out of cassava. In Nigeria, it is called Cassava Fufu or Akpu. In Cameroon, it is called Water Fufu. 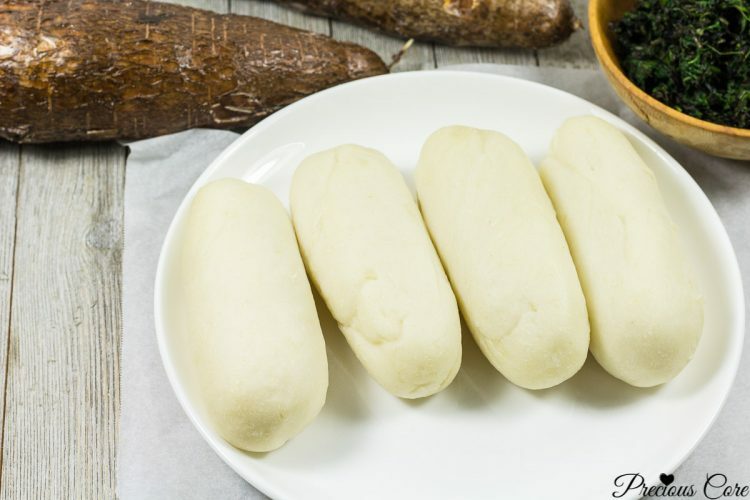 Water Fufu is made by fermenting some cassava, also known as yuca root. 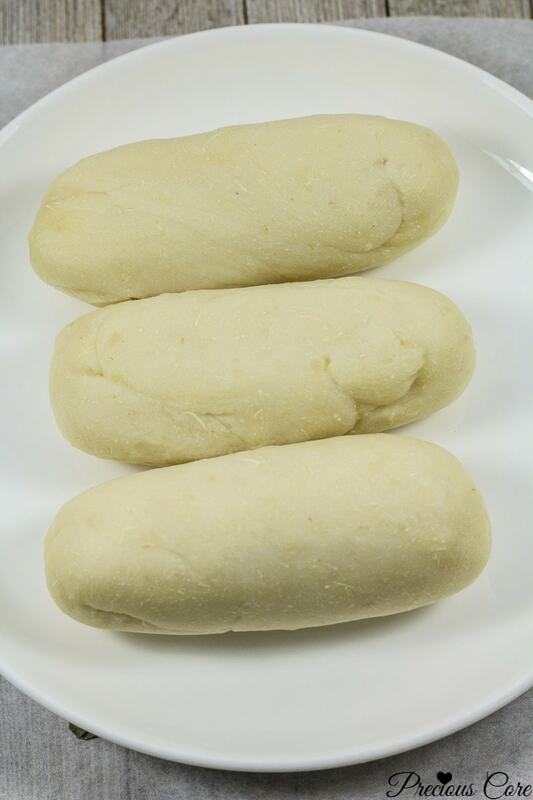 The fermented cassava is ground into a puree which is eventually cooked into delicious fufu. 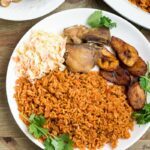 This can be eaten with a number of soups like ogbono soup or okra soup. The most common way it is eaten in Cameroon is with this vegetable called eru. The combination of water fufu and eru is absolutely delicious! In Nigeria, cassava fufu is eaten with egusi soup, bitter leaf soup, ogbono soup, and a host of other soups. I love it with Nigerian egusi soup! So how does it taste? Cassava Fufu has a taste that is hard to describe. Let’s just say it tastes like ground cassava (LOL, I’m trying!) It has a rubbery texture and when paired with vegetable, it is so good. I served it here with Ndole because that’s what I had at home (by the way, this combo is the truth!) I actually wanted to show you guys a picture of water fufu served with eru but I just couldn’t resist eating all of the eru I had at home right after I finished making the fufu. 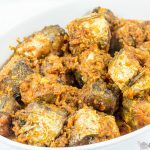 Don’t blame me – fufu and eru is just too good! I made a video to show you guys how to make this fufu from scratch. Yep! You’ll see me walk you through the entire process and share lots of tips on how to make your own Water Fufu. 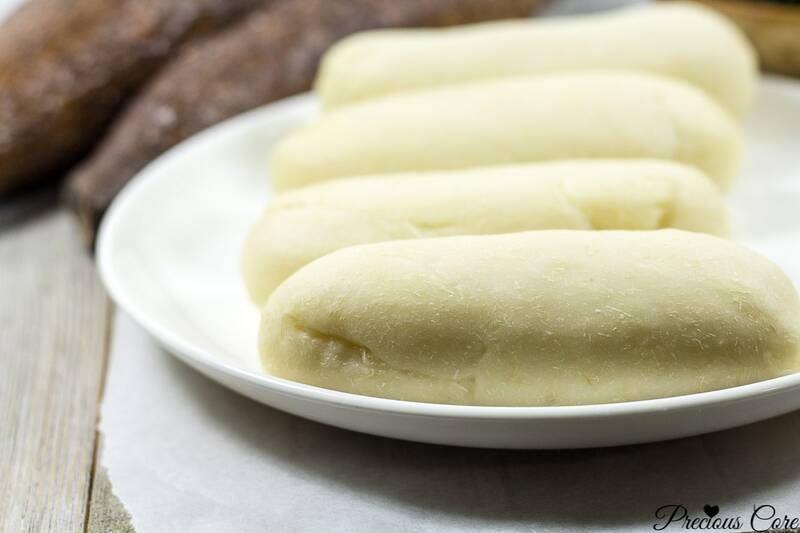 No matter where you are, as long as you can find cassava, you can make your own Cassava Fufu. Fufu is a staple in a good number of African countries. This version is made by fermenting cassava (yuca roots) then blending and cooking. It can be enjoyed with any soup of choice. Peel the cassava. Cut each tuber into 5 or 6 pieces then split each piece in the middle part where you can see the fibre. Use a knife to lift up the skin from the divided cassava then use your knife or hand to take off the whole skin. Wash the cassava thoroughly and place in a large container. Pour in water to completely cover the cassava then add in two teaspoons of baking soda. Cover the container and keep it to ferment in a warm corner for 3 - 5 days. To check if the cassava is well fermented, press with your fingers, if it is soft then it is okay. Note that all might not be very soft but if most are soft then you are good to go. 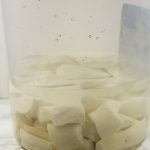 Strain the fermented cassava to remove excess water. Then place in a blender or food processor and process into a puree. You may have to do this in two batches. Now remove any fibre you see in the puree. 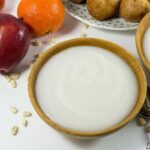 You can do this by either running your hand through the puree and picking out any fibre, or by adding water to the puree then passing it through a strainer. It is recommended that you use you hand if you intend on cooking the fufu right away. Pour the puree into a clean kitchen towel or cheese cloth the squeeze to remove excess water. If you added more water to enable you pass the fufu through a strainer, you may need to squeeze longer. Or tightly tie the kitchen cloth containing the puree and place in the kitchen sink with a heavy object on top to help push out the water. When the excess water is out, your fufu is ready to be cooked! Place the raw fufu in a pot then run through it with your hands to dissolve any excess lumps. Add a quarter cup of water and mix to form a paste. Place on medium high heat then cover and let it rest for two minutes. Begin stirring with a wooden spoon, mixing hard enough to dissolve the lumps that form as it cooks. Add water as needed (about 1 cup in total) while stirring to ensure that the fufu is not too strong. Please see video to see how the texture should be. Keep mixing on heat until the fufu moves from being bright white to an off-white colour. It is ready when it is an off-white colour. Turn off the heat then mold the fufu into lumps (shaped like small logs of wood or like balls) if you wish. Enjoy with any soup of choice! I love enjoying it with eru or ogbono soup. 1. The baking soda in this recipe helps initiate the fermentation process. This is important if you purchase your cassava outside Africa. Hmmm. So much work goes into making it oh. You know in pays, some people tie it in a sac(typically one which originally came with salt) when it becomes soft and put a “grinding stone” on it overnight to press(drain) the “water” from it na…hahaha. Even as modern as your method is (blender, immaculate white cloth & all), e still show say the work plenty!! I travel for this one lol (Yeah…lazy me!). Furthermore, I will only eat my eru with water-fufu if i have tried everything i can to find garri without success. Plus, this waterfufu & ndole combo get as e be oh. I sha will not completely rule it out until i try it. More miyanga to your armpit ma’am. Lol. stay blessed! Looks delicious recipe! I wanna try one. I have one question. Is there any alternative to baking soda? Hi Luis, there is no alternative to baking soda that I know of. I have dry water fufu from cameroon and I was wondering how will I be able to cook it? Hi Lisa, mix it with water to form a paste like the fresh one. Then proceed to cook it the same way we cook the fresh one. Hope this helps. Interesting post. 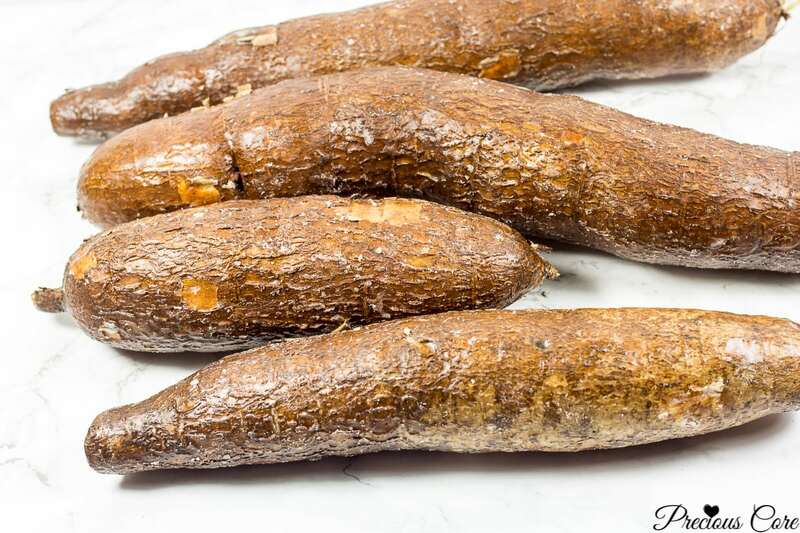 I am Nigerian and I have never heard of cassava fufu before but the igbo tribe has something called akpu that I think is quite similar to this. By the way, you soup with the vegetables looks sooooo delicious! I really wish I could have some. Yes Jamila, it is quite similar to akpu. Hi dear the cassava fufu is the same as akpu, if you have your motar with you, you can pound it, but if not you make it the semo way. Is the same thing lol. Hi Eka, it depends on how long you would love to keep it for. If you want to preserve it for just a few days, use the fridge. If you will be preserving it for much longer like a few weeks then use the freezer. Hi Precious, I tried this out and thanks to you😊😊. But mine came out as garri and I steeped it for 7days but it wasn’t as soft as yours. What did I do wrong? Hi Chocolate, so sorry I’m just seeing your comment now. Did you add the baking soda like I recommended? Did you keep it in a warm place? It needs a lot of warmth to get soft. Hope you try again and please let me know how it goes if you do. Hi Precious, Glad to find you. Let me introduce myself. I am Indonesian and my husband is Cameroonian. I really like African cuisine but I find it difficult to learn cooking African cuisine in my country. So far I can only cook tomato beef. Lol… my husband says that my cooking is perfect, he wants me to learn to cook more African dishes. And you help me for this. Thanks Precious, you are such a helpful angel to me. Hi Grace, you are so sweet. Thank you dear! Do you follow me on YouTube too? There you can watch me cooking so the whole process can be easier for you. Please let me know if you try any recipes. All the best! Hey, Precious, thank you for yOur videos. You’re absolutely amazing. 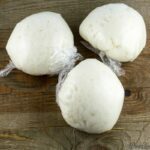 Is it possible to ferment already frozen grated cassava into waterfufu? Hi Chantal, I’m sure you can but I’ve never tried that. You’ll never know unless you try. Please let me know how it goes. Hi Gudi, your situation is very normal especially when you live outside of Africa. That’s because the cassava you find will likely not get soft fast. Did you add baking soda to the water before keeping it to ferment? I’ll advise you add that if you didn’t do so before. Also, be sure to keep it in a warm place. The bad smell is very normal – it’s a result of the fermentation process. Hope this helps, dear. Thanks for the video. I have some leftover foo foo that’s been in the refrigerator for several days. How do I warm it up to eat? Hi Mieke, you could warm it up in the microwave if you have one. Or just leave it out of the fridge for a while to come to room temperature then you enjoy. Mr Gwaro, use to make fufu with Bisquick, it was sooo good. He cooked soup with the fufu. deep frying would give it another twist. Also could you add spices to it? Hi Titly, I don’t think that will work. For fries I would rather cut the cassava (yuca root) and make fries. Yes, you can definitely add spices to your fries. Hope this helps and so sorry for the late reply. Also, so sorry for the late reply. I’ve been so busy and just catching up with comments now. Have a great weekend! Thanks. I did buy the Ninja blender. When blending cocoyam, do I have to use a little bit of water to facilitate the blending process or I can blend without adding water? Thank you so much for this information! I can’t wait to try this. Do you know, can the same fermentation process be used to make attieke? I buy attieke in small boxes on Amazon, but it’s expensive for only a little amount and I would like to learn to make my own. 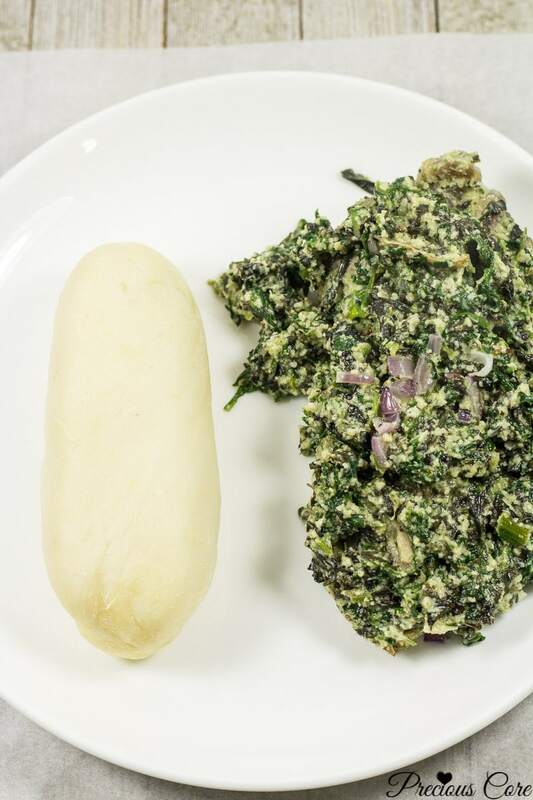 I wonder if attieke is cassava fufu that has been chipped into little bits and dehydrated… do you have any idea? Thank you! Hi Sarah, it is similar to attieke in that they both use fermented cassava but the processes are different. So sorry, wish I could help. Hi Precious, I finally just got around to making this. It’s so good, thank you!! Hi Sarah, so glad to hear that! Thanks so much for coming back to let me know!! I’m so glad I found your site. I love to cook all types of food. I had this at a naming ceremony when I was a child but I’ve only had shortcut imitation ones as since then; I’m excited to make the real thing. Question: It has no salt? Does the baking soda or fermenting give it some salt type taste? Hi Oleanji, so sorry for the late reply. The baking soda doesn’t make it sound salty at all. Please let me know how it goes if you try it. Watched this video with my hubby last night. Then he asked what is the difference between stew , sauce and soup. All i could think of was the thickness of each. The stew being thicker and soup being lighter. Sauce in between. A soup is lighter and contains more water than a stew. So that’s right. A sauce is mostly a condiment that is eaten with other meals. Hope this helps. Hi dear, do I use baking soda in a fresh fufu? Hi dear, do I use baking soda in a fresh cassava? Hi Vidy, are you in Africa? In that case, you won’t need to use baking soda. Hello Precious, I’m hoping you will reply. I saw your video and tried to make the fufu last night. I live in the Caribbean and our cassava is fresh and does not need baking soda to ferment. I’m not sure how to know when it’s cooked and I’m worried about eating uncooked cassava! My fufu was not an even colour and when I applied water to mould it into a shape, it seemed a bit “wet”. 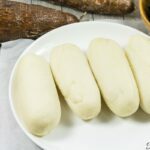 While we have a tradition of eating cassava in the Caribbean, fufu is completely unknown so I’m not sure how it should be. Hi Alisa, the uneven colour might be because you didn’t stir it enough so everything is even. It could be quite hard to stir – it is a workout. Also, if it is wet and sticky, it means you put in more water than needed. To save that, you could make a little hard fufu if you have more raw fufu and add to the soft one. The new one you make should be very hard so when you add it to the soft one and mix, it will get to the right consistency. The fufu is ready when it doesn’t taste gummy anymore. Hope this helps. What am I supposed to do if I have fresh cassava? Follow every process exactly the same but omit the baking soda. Hi, I have never had fufu but I’ve been wanting to try it. I didn’t think my local groceries carried what I needed but am I I understanding correctly, that it’s just yuca root? Yes it is just yuca root. Thank you for responding. I started the fermentation process on Sunday and today, I notice bubbles in the water. Is that normal? Hi Krys, yes that is totally normal. Does Cassava fufu tastes better than Plantain fufu? I made the plantain fufu and did not like it at all. The flavor was not pleasant. Please let me know if the yucca is better. I’ll be making fufu for the first time (eating it for the first time too). Quick question, if I make it in the afternoon for dinner, and have left over, can I still have it the next lunch? Will it stay good? How to store the leftover (fridge or outside at room temperature)? Hi Maple, you can store the leftovers in the fridge but you will have to let it come to room temperature before you can eat. That’s because it will be very hard when it stays in the fridge. You can also keep it at room temperature too. Please let me know how it goes.